Venue: Marble Kitchen, The Parade. Imagine Eugene McSweeney was cooking long before Edward Hayden was born! This cookery demonstration is going to be a very special one as the effervescent Edward chats with ebullient Eugene while he cooks some of his favourite food from his outstanding culinary career including the famous Lacken House Restaurant, Kilkenny. Hear about Eugene’s culinary journey, the highs and lows, and how our tastes, insights and interest in food has changed over the past fifty years. Eugene was ahead of the game – he was the owner and Head Chef of the much-praised Lacken House Restaurant which opened its doors in 1984. Eugene and his wife Breda ran Lacken House for 19 years and won numerous awards for his culinary innovation in using locally foraged food and by introducing local artisan foods to his customers. Lacken House was the first non-hotel restaurant to open in Kilkenny and was visited on several occasions by Irish Presidents Mary Robinson and Mary McAleese. Eugene McSweeney is one of Ireland’s most experienced and accomplished Master Chef with a Degree in International Culinary Arts and FETAC ‘Train the Trainer’ qualification. He is currently working as a freelance food consultant. 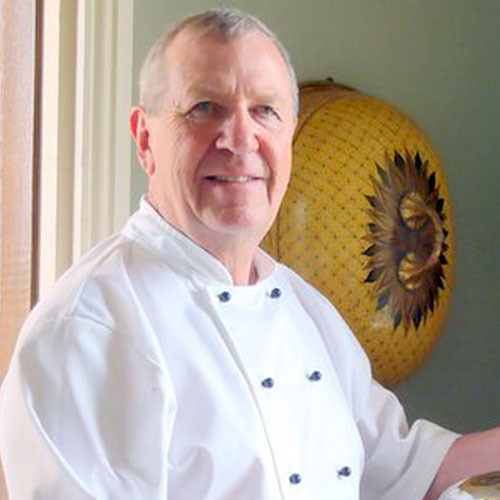 In 2008 he was presented with The Savour Kilkenny Food Festival Award for outstanding contribution to championing Irish and local food industries and advancing the culinary scene in Kilkenny. As well as a winner of over 25 Irish and International Gold medals, including Irelands first Olympic Culinary Gold medal Eugene has a wide range of experience and expertise across the food industry; as recipe writer and columnist; he has been consultant chef to some of Ireland’s top hotel and restaurants, including Mount Juliet, The Conrad, Castle Leslie, Harvey’s Point and The Shelbourne Hotel. and radio programmes at home in Europe and in the USA, including Good Morning America. A former Commissioner General for Euro Toques Ireland, he served as European Secretary General during Myrtle Allen’s period as European President, Eugene is committed to promoting local food innovation.